One would think that since we’re in Thailand, we’d have loads of Thai temple pictures stuffed in our camera’s memory cards. 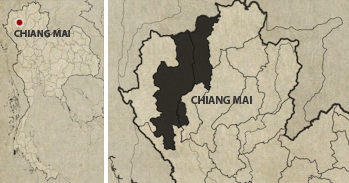 Well, we could’ve done that, but our host for the Thailand Connect: Hip & Heritage Business Events tour tried to steer clear of the usual touristy areas. 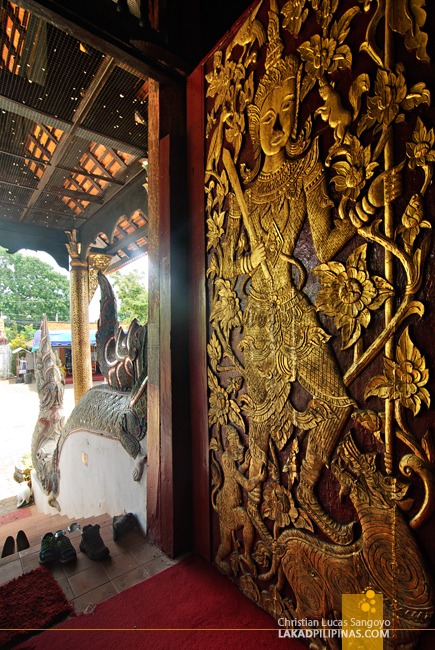 It was only on the last day of the tour that we got to visit a temple, and it was in Chiang Mai. 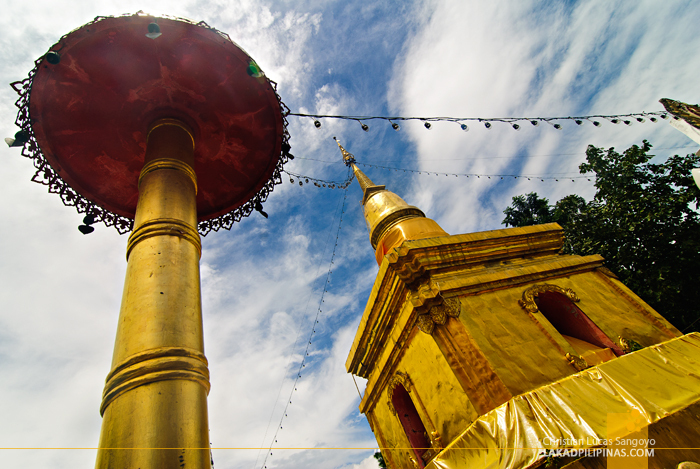 Wat Buak Krok Luang was the chosen temple for that day. 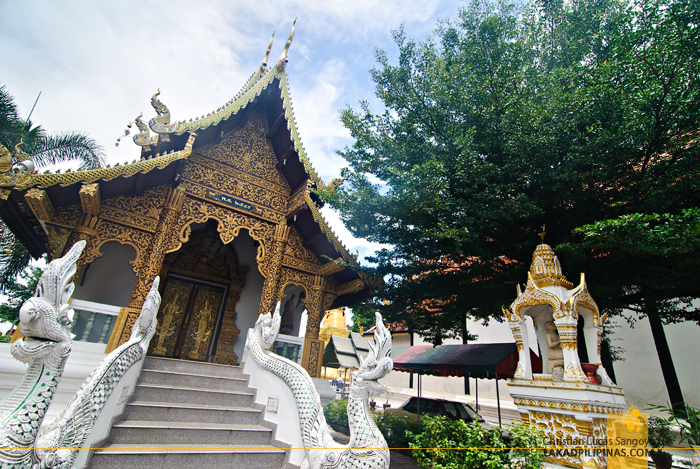 Located at Amphoe Mueang, Chiang Mai’s capital district, it sits on one of the quiet streets of the town. There were hardly any tourists when we visited; it was just us, a single orange-robed monk and a faithful, offering prayers to a dark statue outside the temple. The complex, while not that large compared to Thailand’s other major temples, comprises of three structures; the main one where the image of Buddha is relegated, a golden stupa-like structure which is commonly called a chedi, and another smaller temple located at the left side of the lot. Even with its smaller stature, I still can’t help but admire the level of workmanship that has gone to every detail of this minor temple. The door itself, which is adorned by mirror images of what looked like teppanoms or mythological angels, is simply too stunning to behold. 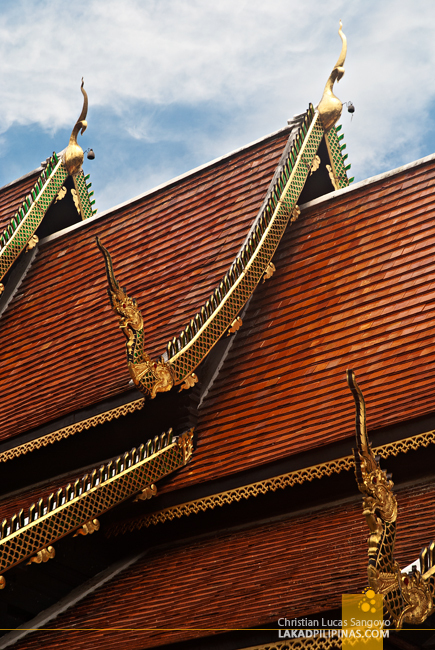 The main temple of Wat Buak Krok Luang is characterized by a multi-tiered roof, reminiscent of indigenous Lanna Style of architecture. This particular temple has a total of four roof layers, tapering from the largest to the smallest; from its front, all the way to the back of the structure. Our host told us that this is one of the oldest temples in Chiang Mai, dating back to the 1800’s. 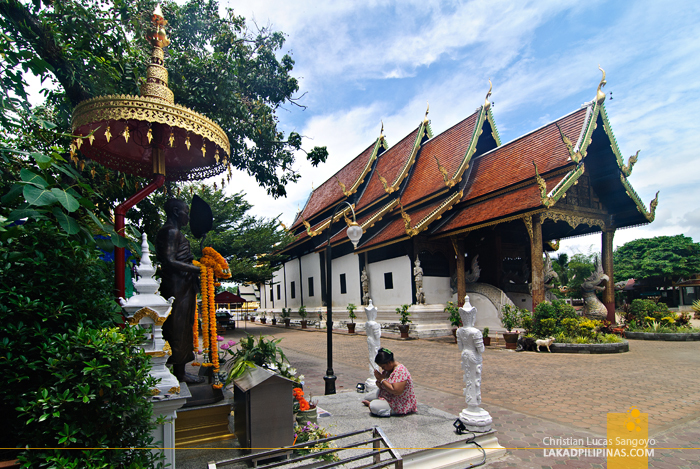 The temple has been documented in Thai writings since 1822 and has also been referred to as Wat Muang Kham and Wat Buak Krok. 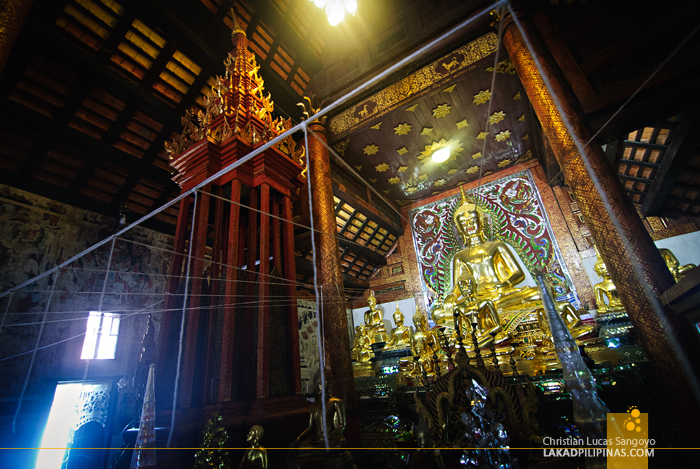 It has constantly been restored by Lanna royalties and its last was done by Prince Rachaphakinai in 1925. Two serpents with bird beaks flank the steps leading towards the main hall of the temple. 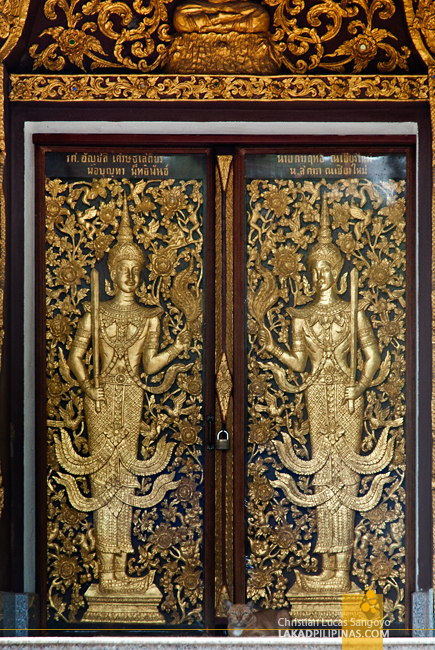 Its doors are also inscribed by golden images similar to the smaller temple inside the compound. 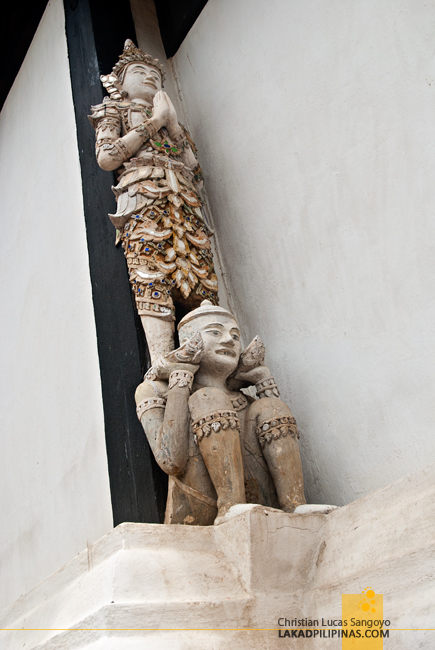 Like all Thai temples, visitors are allowed to come in but they must remove their footwear before entering. 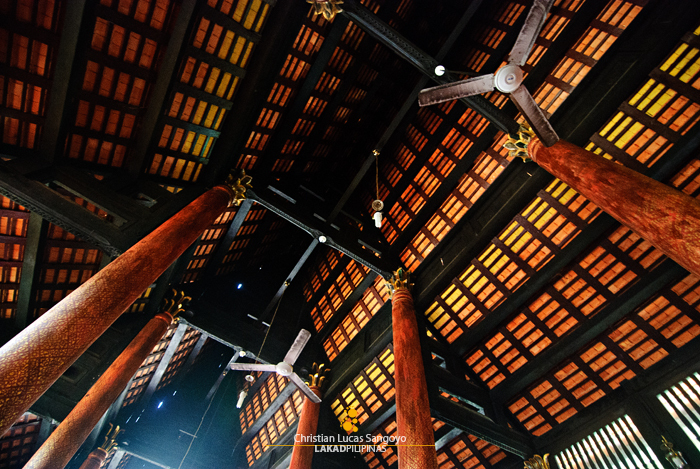 The interior of Wat Buak Krok Luang is expansive; the ceiling, supported by intricately painted pillars soars high. While everything still looks like it probably does a century ago, dust-encrusted ceiling fans are probably not part of them, lol. The focal point of the temple are its walls. 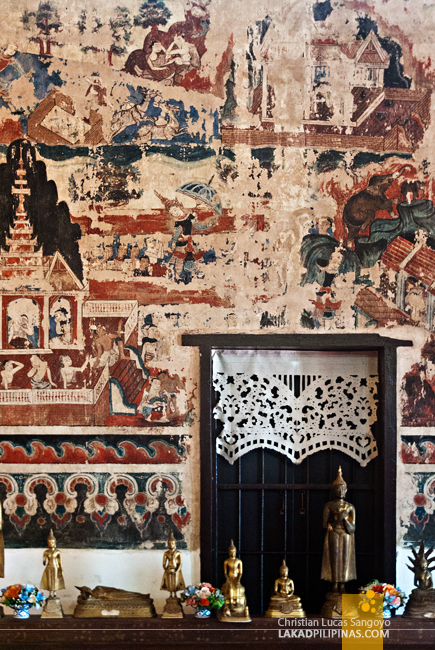 The whole interior is painted with a mural from the Shan school depicting Buddha’s life, from his departure to his enlightenment, as well as ordinary scenes regarding the life of the Lanna people. It is a great work of art, although deterioration can now clearly be seen. And then there is, of course, the grand golden Buddha image at the center of the temple. It is said that the pulpit was built by the Princess Chamarirachatewi, consort to the Prince Keo Narawat. All these names and dates really don’t mean much to me, being foreign to Chiang Mai culture and history, but that’s not to say that I didn’t appreciate the grandness and the design intricacies of Wat Buak Krok Luang.